An Afghan-American pilot hopes that other young women will follow her flight path. 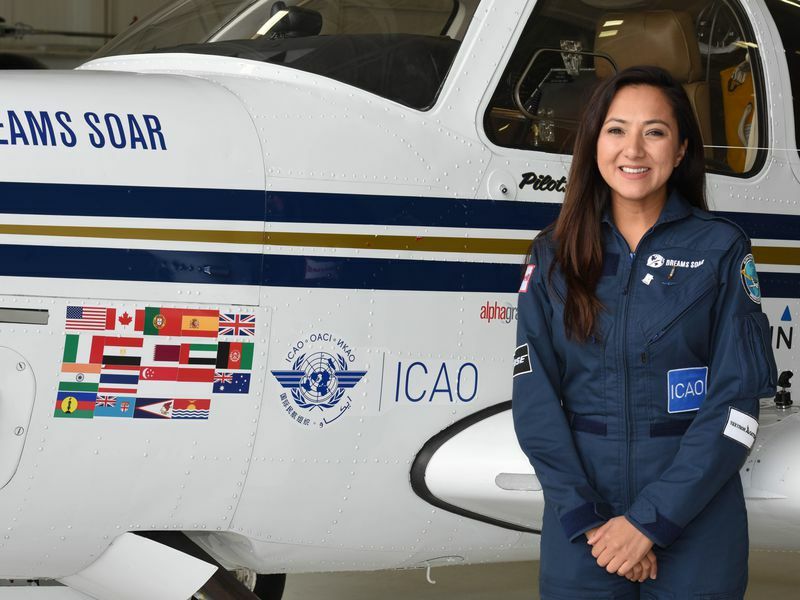 The first certified civilian female pilot from Afghanistan, Shaesta Waiz completed a solo flight around the world in 2017. For her work inspiring young people, she was awarded the National Air and Space Museum’s trophy for current achievement. Waiz is the founder of Dreams Soar, a nonprofit dedicated to inspiring the next generation of STEM and aviation professionals. 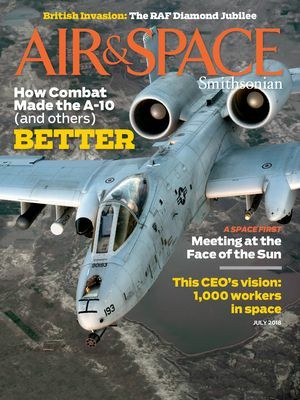 She hopes to establish a flight school for girls in Afghanistan.Waiz spoke with senior associate editor Diane Tedeschi in April. Air & Space: When did you start the flight and when did you finish? Waiz: I took off on May 13 of 2017 [from Daytona Beach, Florida]. The journey was 145 days long, and I completed it on October 4 of 2017. Were you comfortable with the solitude of flying solo? My average flight time was about nine hours. I would take off first thing in the morning, right before sunrise. But because I was flying easterly, the sun kept going down sooner and sooner. So the amount of daylight in the airplane sometimes was just for a couple of hours. And a lot of my flying was done over isolated, very remote parts of the world. Often when I would be sitting in my seat in the dark, over an ocean, and flying to my next destination, I’d think about the kids that I had met in past stops. And the kids that I was going to meet in the upcoming stops. Their reaction, their smiles, their questions—that is what really kept me going. Did you do anything to pass the time? Music is necessary. You’ve got to keep your brain working. I had a routine: Once I had the aircraft established in cruise, and I checked my fuel and all of my instruments, I would do stretches. And I would constantly eat snacks. And of course I had the best view outside. The game is to stay awake, to stay alert. What was on your playlist? One of my favorite songs is by Coldplay. Their music is just so amazing. But one song that was on repeat for the bulk of the journey was “Adventure of a Lifetime.” It’s such an upbeat song, and I kept thinking: I’m on an adventure of a lifetime. I also listened to soft violin music, something that didn’t have words so I could focus on air traffic control calls and radio calls. What were some of your go-to snacks during the flight? I wish I could say it was healthy items, but to be honest, I love potato chips. That was something that I loved to munch on. What was the most memorable view you experienced? I was flying from an island off of the coast of Portugal into Madrid, Spain. And when you’re a pilot flying over ocean, when it comes to fuel, there’s a point you keep track of, and it’s called the point of no return. What this means is that once you pass it, you will not have enough fuel to turn around and land back where you took off from. So you’re committed after this point. And I remember, I’m coming up on this point of no return over the middle of the Atlantic Ocean, and I looked out, and all I saw was blue. Blue water, blue sky: There wasn’t any sign of life. I couldn’t see birds, I couldn’t see boats. It was me in the middle of the Atlantic Ocean. And I thought in the history of aviation, only seven women have crossed this ocean by themselves. And I shared this unique moment with them. And I would have never guessed that me, a person with my background, would be the eighth woman to look out the window in the middle of the Atlantic. Was there ever a time when the weather conditions made you nervous? But my options of landing were zero. I couldn’t land in Kuala Lumpur because of the thunderstorms. I couldn’t fly into Indonesia because of the volcano. My only option was to fly forward or to turn back around and attempt to land back in Thailand. But all of the storms that I had just dodged had grown, so I knew turning back wasn’t an option. It was really dark outside of the airplane. But looking forward, there was this little window of sunlight, and I kept looking at it. And I kept calculating my groundspeed and the distance I had to travel to get to that point. Math-wise, I calculated that I was going to pass through the storm, and get to the other side. But your eyes respond to what’s out there in that moment, and so it was a scary moment where I thought, gosh, I really wish I was at home curled up watching Netflix. But I kept flying, and I got through—just before that window closed up. I landed in Singapore, and I kid you not: I was kissing the ground when I landed. Who in the aerospace community inspires you? Oh, my goodness. There’s so many. A mentor of mine is Barrington Irving. He holds the world’s record of being the youngest man to fly solo around the world—back in 2007. And he was the first African-American to do so. He has a nonprofit organization called Experience Aviation. What I admire about Barrington is that I approached him in the very early stages of my planning the trip around the world. And when you talk about mentorship, he really redefined what having a mentor should be like. I hadn’t traveled a lot out of the country, and Barrington—he does expeditions around the world flying a jet for his organization. About four years ago, he asked me to join his team, flying all over Russia and Asia. He said he wanted me to do this so that I can sit in the cockpit and just absorb everything: international flying, radio calls. Once you land at an airport, what the customs is like. He took me under his wing, and that gave me confidence to pursue this dream. Because you know, I had never been to the desert before. I had never been to Asia before. You’re in an airplane, far away from home. And you don’t know what’s around the corner. You don’t know what the world looks like when you park—it can become very scary. But to my surprise, the world—it’s not so different once you’re in the sky. You look at these countries that have borders, manmade borders separating each country from another. But in the air, it all looks so very connected. Probably one of the biggest lessons I learned is that at the end of the day, we are all of the human race. And when you’re in the sky, every country looks like it belongs there—it’s connected. So that was an amazing experience that Barrington gave me. Tell me about the flight school you want to start in Afghanistan. During my stop in Afghanistan, I got to meet a lot of young girls. I think it was a total of a thousand when you break down the three days that I was there. And these girls—when you think of a country like Afghanistan where it’s very traditional—you really have to start with the women. Because the women are the future mothers to the next generation. They’re the ones who are going to teach their sons and daughters what they can do. So this is a project that I’m working on right now. What I’m looking to do is start a STEM-based school in Kabul, Afghanistan, where young girls after school come and work on a STEM project that has them utilizing their country’s own resources. Afghanistan—I believe it’s the third most resourceful country as far as natural resources go. So utilizing those natural resources, working on a project that’s going to better the community, I think is going to really empower the girls into believing that they can do these things. They can pursue careers that are not just being a housewife and having a family. A component to the STEM school is a flight training program. That’s where my heart is. That’s where I get excited, because it’s sad to know that in the history of Afghanistan, I’m the only civilian female pilot who has experienced being the sole pilot of an aircraft. That idea, it breaks my heart. There are a lot of limitations [in Afghanistan] because the elevation is so high in Kabul, and they have all sorts of no-fly zones. Yes, the infrastructure right now is difficult, but nothing is impossible. I’m trying to establish a relationship with the Afghani government—and with other institutions—to bring a flight school that will be safe and that will allow these girls to fly. Aviation is my life. It’s what makes me me. And I’m always going to be flying. Sometimes people ask me: Well, why don’t you become an airline pilot? But I have this platform, and I feel like I need to do something with it. I’ve had this pleasure of experiencing flight, and why not try to find ways for other girls to experience the same thing? I really think that’s my purpose in life. Diane Tedeschi is a Senior Associate Editor at Air & Space.